Nachos Fries are slated to return to Taco Bell for a limited time nationwide starting January 24, 2019 but the chain will be giving away free Nacho Fries, while supplies last, in 10 markets across the US on "Fryday," January 18, 2019, from 10 AM to 2 PM (local time). 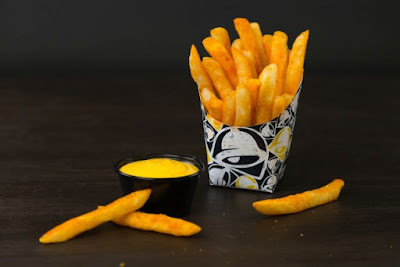 Nacho Fries consist of lightly-battered French fries dusted with a bold Mexican seasoning served with a cup of warm nacho cheese sauce for dipping. Update 1/25/19 - As before, a Supreme and Bell Grande version are also being offered (both come topped with seasoned beef, nacho cheese sauce, tomatoes, and sour cream; but the Bell Grande is bigger). The suggested price for a regular order of Nacho Fries is $1.29, while Nacho Fries Supreme is $2.49 and Nacho Fries Bell Grande is $3.49. They'll be featured in a Nacho Fries Box combo along a Beefy 5-Layer Burrito, Nacho Cheese Doritos Locos Taco, and medium fountain drink for a suggested price of $5.